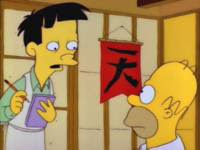 Probably my favourite ever episode of The Simpons is the one where Homer goes to a Japanese restaurant and eats fugu (from the deadly poisonous blowfish) and learns he's going to die. There's a hilarious exchange between Homer and Dr Hibbert who tells him the bad news. The doctor explains that Homer will experience the five stages of grief, but as he lists them Homer experiences each stage instantly. It's a lot funnier than it sounds, honestly. Right now I think Ireland is going through a collective grieving process for the untimely demise of the Celtic Tiger. Our denial phase was when we voted No to the Lisbon Treaty. We then got angry with the politicians when the ESRI brought out their "we'll all have to emigrate" economic commentary; then we started bargaining about public sector pay - like that would solve things for us. So now I reckon we're at about stage 4: depression - to judge from the competition between banker and stockbroker economists to publish the gloomiest forecast. Maybe we should all stand in the rain and flagellate ourselves with a copy of Goodbody's latest economic outlook? The weather only adds to the gloom, of course, and the troubles at Dublin airport sort of implies there's no escape, right? Still, I think we'll get to the stage of acceptance some time around September when we will have had (hopefully) a few weeks of actual summer, and the usual routines of school and work (and government) will be back upon us again. We may not have progressed through the five stages as quickly as Homer, but we've moved at a fair pace nevertheless. Anyone for sushi? Mmmmm flagelation [homer drool noise]. Just kidding. Dunno that it's going to be that quick, I still think there is a certain amount of reeling at the news that all is not rosey. Then again, I want wholesale depression to bring land prices down in Tipp so I can get a bit cheap. Ultimately I'd like to retire there, but that wont happen any time soon, so instead I'll lash some coppice willow onto it to make sure I can afford to heat my home in 5 years time.